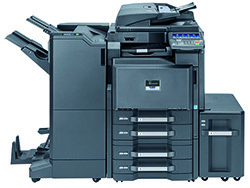 The MFX-2590 features innovative document solutions such as single pass duplex color scanning, direct USB printing and scanning, shift-sort document output, embedded document indexing and an intuitive touch screen interface that combine to deliver exceptional multi-function performance to the desktop. Cost-effectively maximize productivity, with flexible configurations, enhanced functionality and advanced finishing options to meet even the most robust document imaging demands. Powerful and scalable integrated business applications simplify document workflow. And, when combined with award-winning ultra-reliability and unique long-life technology, ensure superior performance and maximum efficiency. For document imaging innovation and quality you can rely on, the CS 3501i delivers. The MFX-3530 from Muratec enables your office to work smarter. This powerful monochrome multifunction printer (MFP) can assist your office in digitally capturing, managing and distributing information more efficiently, enabling you to meet the rising challenges of today’s business environment. The MFX-3590 from Muratec enables your office to work smarter. This powerful monochrome multifunction printer (MFP) can assist your office in digitally capturing, managing and distributing information more efficiently, enabling you to meet the rising challenges of today’s business environment. The ECOSYS M3540idn is a one-stop solution that streamlines document workflows while keeping your bottom line in check. Bringing multifunctional power and mobility to corporate workgroups, it combines crisp 42 ppm black and white output with fax and color scanning. A 7" customizable and tablet-like color touch screen redefines job efficiency by enabling easy storage of routine tasks as well as quick access to business applications that bring added capabilities to your document workflows. As importantly, ECOSYS long life consumables and an impressive drum yield deliver the economical and ecological solution making this device the smart choice for your business. Advanced integrated business applications enable the device to transcend the boundaries of traditional multifunctional printers, creating powerful solutions that fuel performance while simplifying document workflow. Most replacement parts have been eliminated or replaced with long life components. As a result, with the FS-3640MFP you are able to enjoy the benefits of document imaging devices that lower operating costs, minimize downtime, and maximize efficiency. The ECOSYS M3560idn is a one-stop solution that streamlines document workflows while keeping your bottom line in check. Bringing multifunctional power and mobility to corporate workgroups, it combines crisp 62 ppm black and white output with fax and color scanning. A 7" customizable and tablet-like color touch screen redefines job efficiency by enabling easy storage of routine tasks as well as quick access to business applications that bring added capabilities to your document workflows. As importantly, ECOSYS long life consumables and an impressive drum yield deliver the economical and ecological solution making this device the smart choice for your business. 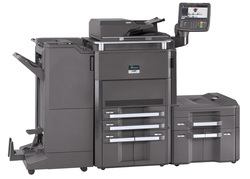 award-winning ultra-reliability and unique long-life technology, and proven leadership in technology innovation, and the Copystar CS 6002i will transform end-to-end document processes… and drive bottom-line business growth. Designed specifically with the customer in mind, the Copystar CS 6501i incorporates the flexibility to tackle both your day-to-day document imaging needs as well as more complex projects with ease, through highly productive functionality and unsurpassed document handling. Robust finishing features and superior technology bring the professional polish your output deserves, while integrated business applications provide added power and capabilities to transform your document workflow and simplify your business processes. Copystar's award-winning ultra-reliability and unique long-life technology ensure the superior performance and proven productivity your busy enterprise requires to keep it up and running at maximum efficiency. When it comes to document imaging innovation and quality you can count on, the CS 6501i delivers. Designed specifically with the customer in mind, the Copystar CS 8001i incorporates the flexibility to tackle both your day-to-day document imaging needs as well as more complex projects with ease, through highly productive functionality and unsurpassed document handling. Robust finishing features and superior technology bring the professional polish your output deserves, while integrated business applications provide added power and capabilities to transform your document workflow and simplify your business processes. Copystar's award-winning ultra-reliability and unique long-life technology ensure the superior performance and proven productivity your busy enterprise requires to keep it up and running at maximum efficiency. When it comes to document imaging innovation and quality you can count on, the CS 8001i delivers.